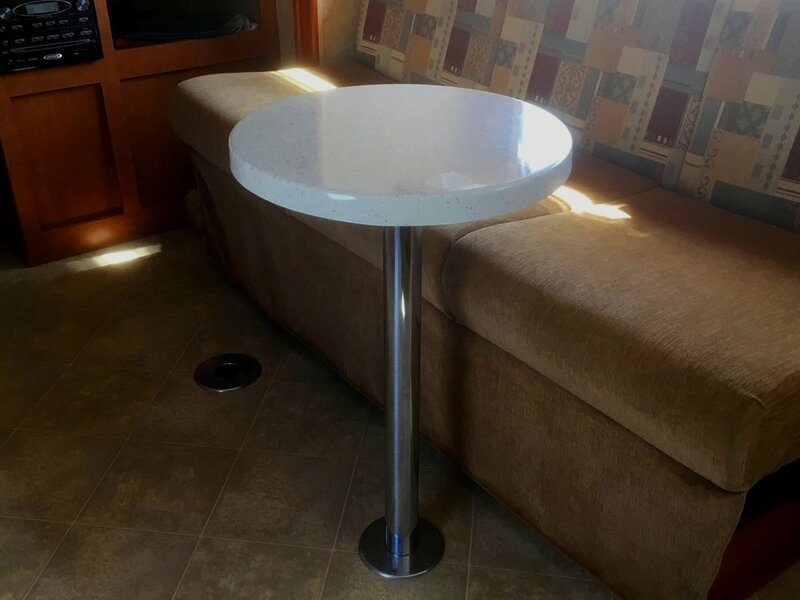 The original cafe’ table by Loveshack is an attractive and sturdy must-have for smaller rigs, where space is at a premium, and for fancy glampers, where luxury and style are what you want. Our quality cafe’ tables are Made in America from start to finish and are built tough with a patented process (USPTO App.#15-935 865) exclusive to Loveshack Industries! Each table is hand made and smooth as glass; don’t be taken by cheap imitations! Only Loveshack cafe’ tables have the look and feel of polished granite with the weight and cost of much less expensive materials. Inside or out, our tables will save space and add style to your next camping trip. Please Note: Your new table is made when you order it; we don’t keep inventory but we’ll get right on it! Please see our FAQs for more information on the process from your order to table delivery. We’re grateful for your business. Happy Camping!